TT-Store Lippstadt - sauerland-opens Webseite! 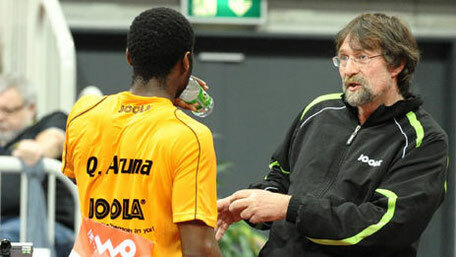 We have been working together with former national coach Martin Adomeit for years now and it's a very successful partnership for both of us. Since the year 2013 Martin is working as a coach for TuS Sundern and improves the skills of our young players in every training session. Seit 2013 ist Martin Adomeit als Trainer beim TuS Sundern aktiv. Advancements in all our teams prove his knowledge on making better players. Every tuesday he's in Sundern vom 4pm - 8pm. As owner of tt-store Lippstadt he's always there if we need any help or advice. Especially in his shop he takes a lot of time to help everyone finding the best rubbers. Of course he supports the Sauerland-Open, too. Prizes für the winners are sponsored by his tt-store for example. Of course he will be there for you in Sundern when the Sauerland-Open take place. Of course you can ensure your own national-coach advice or training session even today.